The idea originated with the Prince Consort, who is said to have designed the medal. The cross carries with it an annuity, then of £10 and now of £1300. In 1902 King Edward VII sanctioned the cross to be given to the representative of soldiers who would have been entitled to it had they survived. The decoration consists of a bronze Maltese Cross, which, until 1942, was made from the metal of Russian guns captured at Sebastopol, in the Crimean War. It is worn with a red ribbon by recipients in the army and with a blue ribbon for recipients in the Navy. 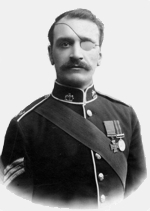 A total of nine serving members of the Regiment were awarded the Victoria Cross. The Conspicuous Gallantry Cross was Instituted in 1993 as part of the review of gallantry awards. It replaced Three previous awards: the Distinguished Service Order for gallantry (issued to officers), the Distinguished Conduct Medal (Army other ranks) and the Conspicuous Gallantry Medal (Royal Navy other ranks). The decoration consists of a cross pattée in silver, mounted on a wreath of laurel leaves. The obverse of the medal bears in the centre a circular medallion depicting St. Edward’s crown. The reverse is plain in design and bears the rank, name and unit of the recipient and the date of the award. The ribbon is white with narrow stripes of dark blue at each edge and a central stripe of crimson. For their conspicuous gallantry, in the assault of Magdala, on the 13th of April, 1869. Lieutenant General Lord Napier reports that while the head of the column of attack was checked by the obstacles at the gate, a small stream of officers and men of the 33rd Regiment and an officer of engineers, breaking away from the approach to Magdala, and climbing up a cliff, reached the defences and forced their way over the wall and through the strong and thorny fence, thus turning the defenders of the gateway. The first two men to enter Magdala were Drummer Magner and Private Bergin of the 33rd Regiment. During the action at Plewton’s Farm, near Arundel, Cape Colony, on the 24th of February, 1900. Lance Corporal Blackman having been wounded and lying exposed to a hot fire at a range of 400 – 500 yards, Sergeant Firth picked him up and carried him to cover. 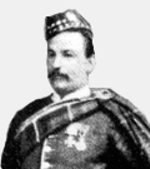 Later in the day, when the enemy had advanced to within a short distance of the firing line, Second Lieutenant Wilson being dangerously wounded and in a most exposed positioned, Sergeant Firth carried him over the ridge, which was being held by the troops, to shelter and was himself shot through the nose and eye whilst doing so. For most conspicuous bravery in attack at Le Sars on 4th of October, 1916. He twice rallied his company under the heaviest fire and finally led the only three available men into the enemy trench and there remained bombing until two of them had become casualties and enemy reinforcements had arrived. He then carried his Company Sergeant Major, who had been wounded, back to our trenches, a distance of 70 yards, and subsequently three other soldiers. He set a fine example of gallantry and endurance. Other Military awards include the Military Cross and Bar, the Belgian Croix de guerre, the French Médaille militaire and the Spanish Grand Laurelled Cross of San Fernando. For most conspicuous bravery and initiative during the attack on a strongly held enemy position south of Langemarck, Flanders on 11th August, 1917. His platoon having been checked by heavy machine-gun fire, he crawled through partially-cut wire, dragging his Lewis gun with him, and single handed dealt with a strong part of the enemy killing about twenty of them and thus covering the consolidation of the position taken up by his platoon, immediately afterwards his Lewis gun was blown up by a bomb and three of the enemy rushed for him, but he shot them all with his revolver. Later, he shot several enemy snipers, exposing himself to heavy fire each time. On returning to the original post he also brought back a wounded comrade under heavy fire at the risk of his life. He displayed throughout an utter disregard of danger. For most conspicuous bravery when acting as a stretcher-bearer, at Erquinghem-Lys, on the 10th of April, 1918. 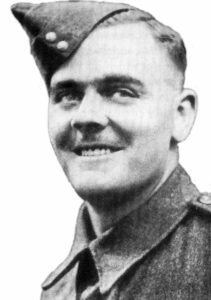 On ten occasions Private Poulter carried badly wounded men on his back to a safe locality, through a particularly heavy artillery and machine-gun barrage. Again, after a withdrawal over the river had been ordered. Private Poulter returned in full view of the enemy, who were advancing, and carried back another man who had been left behind wounded. He bandaged-up over forty men under fire, and his conduct throughout the whole day was a magnificent example to all ranks. This very gallant soldier was seriously wounded when attempting another rescue in the face of the enemy. 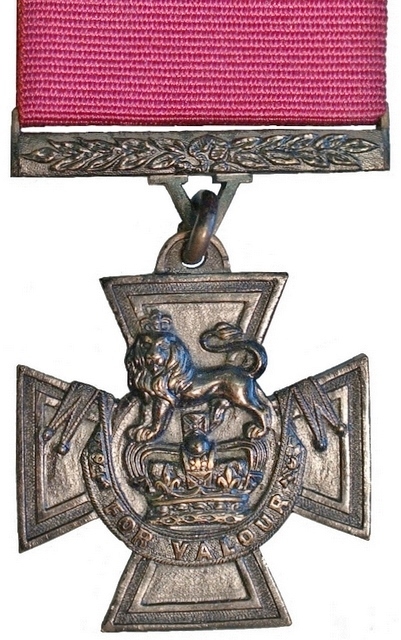 For most conspicuous bravery and initiative during the capture of the village and the crossings at Marcoing and the subsequent counter-attack on 28th of September, 1918. When, during the advance on Marcoing, his platoon was held my machine-gun fire, he at once crawled forward, located the machine-gun, and with his Lewis gun team knocked it out. On arrival at the crossing he restored the plank bridge under a hail of bullets, thus enabling the first crossing to be made at this vital spot. Later in the evening, during an attack, he, with eight comrades, was surrounded by an overwhelming number of Germans and, though the position was apparently helpless, he led a bayonet charge through them, fighting so fiercely that 37 of the enemy were driven into the hands of the remainder of his company. Although twice wounded he refused to leave until the fight was won. NB: Tandey donated his medals to the Duke of Wellington’s Regimental Museum. On special occasions and parades he would sign them out to wear. During the last period that he had signed them out, he died. Unaware that the medals should have been returned to the museum, the medals were auctioned, by his wife, at Sotheby’s, in London and purchased by a private collector, for £27,000. They were later presented to the Regimental Museum of The Green Howards (the regiment in which he had earlier served), by Sir Ernest Harrison OBE, at a ceremony held in the Tower of London on 11 November, 1997. For conspicuous bravery and devotion to duty on 31st of August, 1918. With three men he rushed an enemy machine-gun post and put it out of action. His post was then heavily attacked and he withdrew fighting, carrying a wounded comrade. 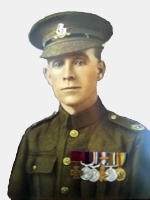 Again on the night of the 31st of August, 1918, at St Servin’s Farm, accompanied by two men only, he rushed an enemy machine-gun post, capturing eight prisoners and enabling the advance to continue. his VC. When his medal was put up for sale it was purchased by the Halifax Town Council, as he was a resident of Halifax. The medal is displayed in the Duke of Wellington’s Museum for ease of access. At Ningthoukong,in Burma, soon after midnight of 6th of June, 1944, an attack was made by a strong force of Japanese. Three out of four light machine-guns in Sergeant Turner’s platoon were destroyed and the platoon forced to give ground. 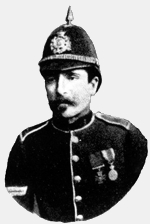 Sergeant Turner, with coolness and fine leadership, at once reorganised his party and withdrew 40 yards. When it was clear that the enemy were attempting to outflank the position, Sergeant Turner at once, boldly and fearlessly, went forward from his position alone, armed with all the hand grenades he could carry, and went into attack against the enemy single-handed. He used his weapons with devastating effect and when his supply was exhausted he went back for more and returned to the offensive again. During all this time the enemy were keeping up intense small arms and grenade fire. 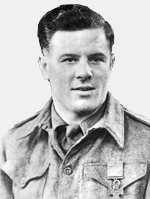 Sergeant Turner in all made five journeys to obtain further supplies of grenades and it was on this sixth occasion still single-handed, while throwing a grenade among a party of the enemy, that he was killed. He displayed outstanding valour and had not the slightest thought for his own safety. He died on the battlefield in a spirit of supreme self-sacrifice. 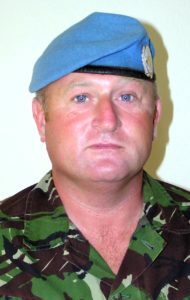 On (29 April 1994), a patrol led by Corporal Mills came under heavy small-arms fire from a group of Bosnian-Serbs. The patrol returned fire, killing two of the attackers. The patrol then withdrew, but the attackers persisted in firing on the patrol. The patrol soon reached an open clearing, where it was obvious they would be highly vulnerable to fire from the attackers. Corporal Mills then performed an astonishing feat of bravery. He turned back and engaged the group in a fire-fight, delaying the attackers long enough to allow the rest of his patrol to cross the clearing. 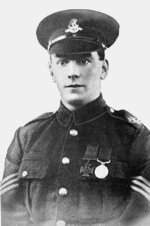 While doing this brave act, Corporal Mills shot the leader of the group, with the rest scattering into the woods.